If stylish, voice-activated Google Glass are all mouth and no trousers, the upcoming Jet smart glasses from Recon Instruments are exactly the opposite. The only speech these rugged specs expect to hear is an adrenaline- soaked scream as you wrestle polar bears or pop a gnarly 360 on your dirt bike. As well recording HD snaps and video like an action camera, the Jet provides visual feedback via a colour microdisplay, showing speed, space, distance and navigation data. If Google Glass looks a bit sci-fi, Jet is a fully-fledged member of the Borg. This is not a pair of smart glasses you'll want to wear around town – and you can in fact detach the electronic components when not in use. 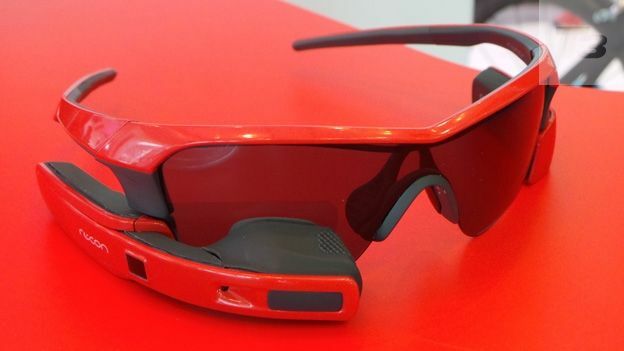 Total weight is 60g (compared to Google Glass's 42g) – split evenly between the glasses and the gadgets. The whole package is supremely well balanced and doesn't feel in danger of falling off your face. A small built-in camera enables action camera footage in HD (resolution is still to be finalised), with a tiny microphone to capture narration. More interesting are the built-in GPS to track your activities, Wi-Fi and Bluetooth to connect to mobile devices, and the low power ANT+ system for hooking up to heart rate monitors, cycle cadence sensors and other fitness gear. Recon Instruments was hanging out at Google I/O 2013 because the Jet runs Android behind the scenes – it's hoping to get developers writing native apps in time for the launch later in 2013. Whisper it, but we actually preferred the Jet's bright colourful microdisplay to the one in Google Glass. The screen is lower res than Google Glass but less ambitious too – showing just the information you need for sporting extreme-ness. Mounted in the lower right corner of your field of vision (rather than Google Glass's upper right), the display is perfectly positioned to flick your eyes down to, just as you would with a cycle computer or sports watch like the Suunto Ambit. Even better, in the final production unit, Recon promises a gaze detection system that turns the display off when you're not looking at it. In a brief test, the display was excellent at showing a graphical speedometer when cycling, and fine for an animated compass needle. We couldn't use the Jet outside, so it's impossible to tell yet whether GPS navigation and performance data display is as fast and reliable as it needs to be. But the success of Recon's winter sports goggles bodes well. Recon says the Jet's rechargeable battery should be good for six hours activity with all sensors on. With its HD camera, an excellent microsdisplay and GPS built-in, the Jet might be a one-trick pony for action fiends – but it looks to be a pony you'll want to ride down the Grand Canyon on a river raft. While abseiling. A guide price of $400-600 looks steep compared to strap-on action camera, but the Jet is set to offer so much more – and at a fraction of the price of its effete (if undeniably more multitalented) rival, Google Glass.